Bake a sheet cake the size you will need. 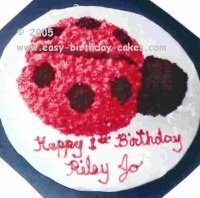 Using the picture as a guide and an icing filled bag with round tip size #5, draw a lady bug on the cake. Cut out the outline of the lady bug. Using a star tip size #18, fill in the spots and the head with dark chocolate icing. Then fill in the body with red icing using the same tip. Finally, draw a line down the middle of the body with dark chocolate icing and round tip #5. Bake the cake using an oven proof bowl. The head is a cupcake with the edge cut to fit the body. Next cut the tips of the wings. Using the star tip size #16, fill in the spots and cover the head with dark chocolate icing. Next, fill in the body with red icing and the same size star tip #16. Finally, draw the line down the center of the body with dark chocolate icing and round tip #5. Don't forget the party favors! 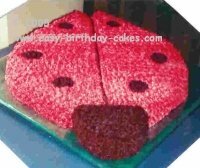 These Lady Bug Candy Wrappers go perfectly with these cakes. They can be peronalized with your birthday message and the birthday child will love handing them out to all of her friends.